Slow Food is the global movement created to preserve regional culinary traditions and encourage people to back local and ethically grown seasonal food. 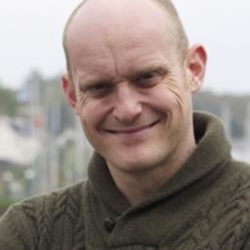 Graeme Taylor, head of Slow Food Glasgow, delves a little more into its history along with the challenges and achievements of bringing this ethos to Scotland's largest city. As a city Glasgow has a reputation for an inherent love of unhealthy food. It is a reputation it might even be said to take pride in; carb-laden, deep fried foods (usually washed down with a huge quantity of ‘ginger’, as we call fizzy drinks) is the Glasgow diet that many an outsider envisages as they approach this beautiful city. Certainly twenty-first century Scotland – and Glasgow in particular – faces many dietary challenges, and numerous studies are aimed at redressing this unhealthy balance that plagues the country. However for me, growing up in the 1980s just outside a city that still relied on heavy industry, this wasn’t the case at all. Food then was usually wholesome, homemade and locally sourced; dishes like mince and tatties, lentil soup and Scotch broth were the staples, made with meat from the local butcher and seasonal vegetables from the greengrocer or farm shop. In the summer we would pick raspberries and strawberries from the local fruit farm with the promise of jam that would last through to the following year: living from locally sourced, seasonal food was the only way of life, not by choice but by necessity. However, into the midst of those days came a food revolution; microwaves and convenience food started to sweep the world, and fast food outlets became more and more prevalent in our cities as free time became shorter and disposable cash seemed to increase. Into this new fast paced, convenience food-obsessed world stepped a man called Carlo Petrini. In 1986 when McDonald's wanted to open their first branch on the Spanish Steps in Rome he decided he had to act – to Carlo, this was neither aesthetically nor gastronomically pleasing. With the same look and flavours the world over, there had to be a way to protect local cuisine from becoming lost. Therefore, with a group of friends he passed out plates of pasta – a symbol of Italian food – as an act of protest against the homogenisation of food culture. While the McDonald's still opened, it made several concessions and from this a movement was born. That movement was Slow Food, with the goal of preserving traditional tastes and products and a belief that everyone on the planet should have the right and access to good, clean and fair food. By the mid-nineties the organisation expanded across Europe and two of the most important projects for what was now a multi-faceted organisation had started; Ark of Taste, which seeks to preserve the culinary diversity of the planet by preserving foods threatened by industrial agriculture, loss of environment or simply through loss to mass produced generic alternatives, and Salone de Gusto, a biennial international food fair dedicated to artisanal, sustainable food, and the small-scale producers that safeguard local traditions and high quality products. The new millennium brought even quicker growth in the Slow Food movement, when the Terra Madre biennial gathering of worldwide food communities was started alongside Salone de Gusto. In 2003 the Slow Food Foundation for Biodiversity was started, bringing together all of Slow Food’s projects to protect biodiversity around the world, including The Ark of Taste and Chef Alliance worldwide movement for chefs who deliver on the good, clean and fair ethos. Three decades have passed from the pasta gathering in Rome, and from those simple beginnings the Slow Food movement now touches all corners of the world. With networks that involve millions of people, presence in over 160 countries and over 100,000 members, ‘Good, Clean and Fair’ has become more than a motto; it is a way of life. Good quality, flavoursome and healthy food, clean production that does not harm the environment, accessible prices for consumers and fair conditions and pay for producers. In fact it is no surprise that Carlo was named by The Guardian as one of ‘fifty people who could save the planet’ when you consider how far and wide Slow Food’s ethos has reached into a world that appears increasingly threatened by issues as wide ranging as food poverty, starvation, obesity, loss of habitat and lack of sustainability. Slow Food has introduced the 10,000 Gardens in Africa Project which is encouraging natural, sustainable farming, efficient use of water and the growing of local varieties, while at the same time in developed countries is supporting small scale sustainable producers as opposed to industrial agriculture. In each area of the world, Slow Food promotes local solutions to local issues. But how does all this relate to Glasgow – a city with a heavy industrial heritage – and what part does the recently formed convivia of Slow Food Glasgow have to play? Carlo Petrini said last year that Scotland is ‘on the verge of a food revolution’, and Slow Food Glasgow aims to be right in the middle of this. Modern Glasgow is a cosmopolitan city with a multitude of green spaces, social enterprises and community gardens which aim to bring food to the people, whether that be helping people out of food poverty, encouraging better food choices or simply providing a communal environment to grow food together. 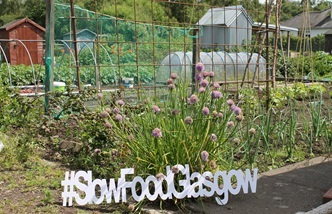 Slow Food Glasgow is looking to enhance this environment by building at the grassroots through a comprehensive approach to good, clean and fair food. The organisation has recently launched the #GrowGlasgow campaign to encourage as many people in the city as possible to ditch the flowers for fruit and vegetables and start growing their own food, whether this is in a full size allotment, a back garden or a simple window box. It is through such simple engagement with the food chain that true understanding of the food we eat is born. 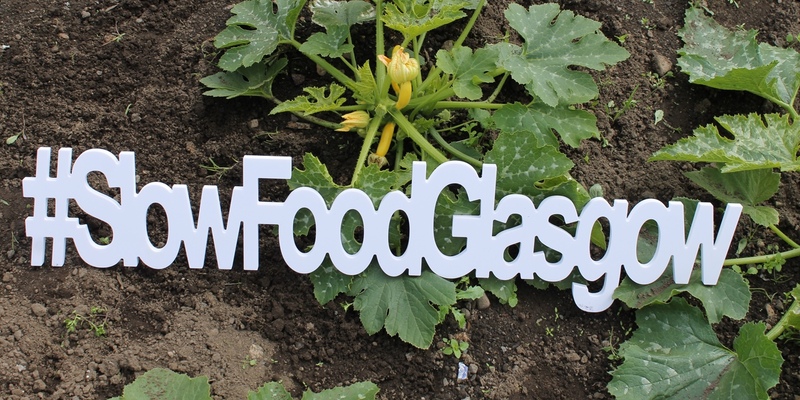 Its aim is to have this culminate in a #GrowGlasgow harvest dinner later in the year where people will be encouraged to come together to share their produce with friends, family, and neighbours.